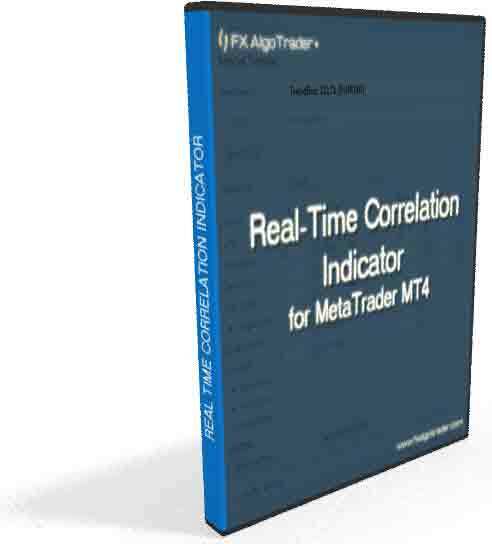 The FX AlgoTrader Real Time Correlation indicator for MetaTrader MT4 provides a real time correlation facility which displays up to 25 user defined assets and their associated correlation on an MT4 chart. The system is controlled by a JavaFX interface which is part of the FX AlgoTrader JFX series of products. Correlation, is the statistical measurement of the relationship between two assets. The Pearson correlation coefficient ranges between -1 and +1. Therefore, a correlation of +1 means the two assets move in the same direction 100% of the time whearas a correlation of -1 means the two assets move in opposite directions 100% of the time. A correlation of zero indicates there is no correlation between the two assets ie their prices move in completely unconnected ways in relationship to each other. Sentiment and global economic factors are very dynamic and can change very quickly. It's important to look at the longer term correlations to gain a clearer perspective relationship between the two currency pairs. Correlations change for a variety of reasons, the most common of which include diverging monetary policies, a certain assets's sensitivity to commodity prices, as well as unique economic and political factors. Correlation is particularly of interest to arbitrage traders looking for situations where the correlation between two normally highly correlated assets breaks down. Such situations can create an opportunity to simultaneously buy and sell each asset. Typically an arb trader analyses the 'spread' between the assets which is effectively the difference between the two asset prices. If one asset price moves up in relation to the other the trader would look to sell the higher priced asset and buy the lower priced asset on the basis the two assets prices come into line or revert to the mean at some point in the future.